Dr. Harald Pressl, Sozialrat and Gesundheitsrat (Social and Health Minister), from Wolfsberg and the HTL Wolfsberg have finished their project. 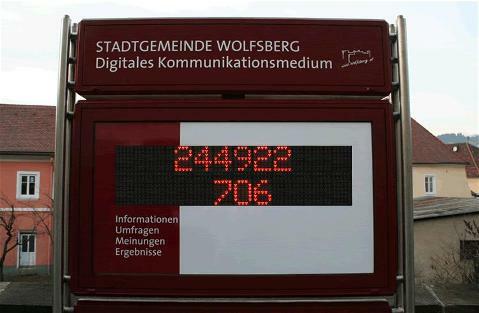 The numbers shining and changing every few seconds on the new information board, in front of the Rathaus Wolfsberg, are displaying the number of people that died due to smoking since the 29th of December 2007, for the whole world in the first row and Austria in the second row. „The world and Austria needs to be informed about this and putting big numbers in front of people’s eyes usually works, at least for good deals when shopping. So, hopefully people will look and start to think.“ says DI Daniel G. Pressl, son of Dr. Harald Pressl and Ceo of Redwired. The proud team in front of the Anzeigetafel. From left to right: Dir. 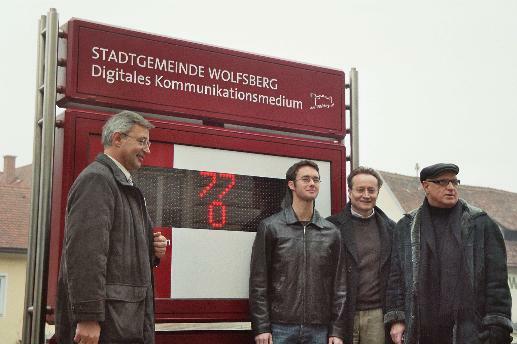 of the HTL Johann Persoglia, Hannes Gross (who constructed and developed the board), Dr. Harald Pressl and Vice-Mayor Heimo Toefferl representing Wolfsberg.